Sally: It's like being in the circus. Cat: Yeah, but without the tortured animals and drunken clowns with hepatitis. 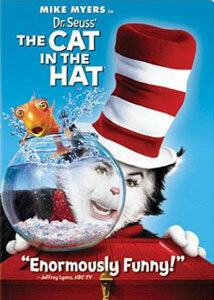 Next to Gigli, this live-action DreamWorks version of the classic and adored Dr. Seuss book probably received some of the absolute worst press and word-of-mouth of any film in recent memory when it was released theatrically in late 2003. Sure, it still made something like $100 million (about $99,999 million more than Gigli), so it wasn't exactly a financial flop, but the buzz on it was awful. Even with likeable Mr. Everywhere, Mike Myers, as The Cat, doing his typical mug-for-the-camera schtick, the film was met with a heaping helping of bad reviews, and finding someone on the street who admitted to having liked it was nearly an impossible task. It was almost as if it was hip to hate it. The previews made it look loud, garish, and largely unfunny; the runtime was barely 80 minutes; and the marketing onslaught and product tie-ins were enough to make me dread the words "cat" and "hat"; I still have nightmares about those Burger King commercials, by the way. Well, I'm here to stand up all by myself, and admit to the world that I have seen Dr. Seuss' The Cat in the Hat on DVD, and I liked it. A lot. Believe me, no one is more surprised to fess up to something like this. I had a gnawing predisposition to automatically dislike it simply based on what I had seen in the trailer, in conjunction with the nagging question of how director Bo Welch could possibly hope to pad the relatively short original Seuss story—about a destructively mischievous six-foot talking cat that dangerously livens up a rainy day for two bored kids—into a feature-length film. Like DreamWorks rendition of another of the good doctor's classics, The Grinch (another noisy, garish film I was prepared to immediately dislike, but didn't), the set design and visual effects really does capture that dreamy, surrealistic Seussian feel to a "T"; the film is a literal explosion of bright colors and weird angles, juxtaposed with a strange and comforting uniformity to everything. But pad the story they did (even if they only made it to 80 minutes) and the screenplay from Alec Berg, David Mandel, and Jeff Schaffer kept the bare essentials (cute kids, big talking cat, destruction, mayhem) and populated the remainder as an excuse for Mike Myers to do a series of unrelated jokes or one-liners, and to utter some decidedly un-Seussian double-entendres. There are new subplots and supporting characters, like the lecherous neighbor (Alec Baldwin) who is wooing Sally (Dakota Fanning) and Conrad's (Spencer Breslin) mom (Kelly Preston)—who is known simply as Mom—or the fat, narcoleptic babysitter Mrs. Kwan (Amy Hill), or Mom's mincing, germophobic boss Mr. Humberfloob (Sean Hayes); these secondary characters exist for no other reason than to give The Cat, Sally and Conrad something more to do and interact with. It is Mike Myers, the guy precariously teetering on one-note overexposure, who manages to save Welch's film from being nothing more than a pitiful mangling of a classic kid's book. It's partly because his Cat borders on being leering and creepy at times (look at the cover, he looks downright menacing), which as an adult viewer, is a weird but intriguing trait to have for a lead character in a film like this. He's sarcastic, he's disrespectful, he swears (it's intentionally beeped) and he sings a couple of songs that are sprinkled with surprisingly saucy double-entendres, again a shocker because it was so unexpected. When he sings his first song it begins with a slow, syrupy piano intro, causing Sally and Conrad to even roll their eyes in dread and anticipation of the schmaltz they expect to come, much like I did. I was expecting more of a saccharine-filled kid's movie, but the subtle off-color tone of the humor gave things a nice edge, and Myers literally and figuratively bounds from scene to scene delivering some truly weird one-liners in his usual array of odd voices and exaggerated facial expressions, usually directed right at the camera. As an added plus, the kids are genuinely cute and fun to watch—something that doesn't always happen in a comedy—with Spencer Breslin and Dakota Fanning actually holding their own against Myers' dominating and manic presence. Maybe not the most three-dimensional roles ever written, but there is a moment late in the film when the two children pair up for a wonderfully deadpan dialogue, sans Cat, that is played with a simple perfection, briefly giving Breslin and Fanning the chance to act a bit. No knock against Breslin, who keenly plays the rules-abhorring Conrad with the right amount of disinterest and glee, but Fanning is something else entirely; the kid has some kind of screen presence, with a decent track record of solid performances (check out the vastly under-rated Trapped). Overall, Welch's film is a strange mixture of sometimes crude humor and noisy excess. When Alec Baldwin's character, who is trying to come on to Kelly Preston, says "Do you have any idea how hard it is? ", he gives the line such a perverse emphasis that the sexual connotations are obvious, and admittedly a little surprising. Likewise with Myers, who makes veiled references to testicles and offers up a quick gag concerning an acronym for a four-letter word. Image Transfer Review: This is a smart-looking 1.85:1 anamorphic widescreen transfer from Universal, with a sharp, crisp image. The film is full of all manner of bright, bright colors, which are all nicely rendered here, with no evidence of smearing whatsoever. Some minor edge enhancement, but overall a solid transfer. A separate full-frame edition is also available, so if you intend to purchase be careful. Audio Transfer Review: Not as immediately impressive is the Dolby Digital 5.1 surround track, which is good, but not necessarily an absolute stunner. Dialogue is anchored firmly in the center channel, with an abundance of off camera sounds taking the form of directional pans that, when used in conjunction with the rear channels. comes pretty close to matching the sort of manic energy of the action onscreen. It's a lively audio mix, properly noisy when it needs to be, but some of the dialogue passages get overshadowed by some of the louder sound effects and score elements. Extras Review: The menu system for this title will either make you chuckle or annoy you, depending on your tolerance for having to sit through animation and live-action chatter. Spencer Breslin and Dakota Fanning attempt to entice viewers to select their particular half of the menu, which leads to two different sets of extras. The problem is that all of the supplements here are so short (none are four minutes each) that it seems you have to constantly navigate and click every few minutes. The absence of a Play All option is another glaring detractor to ease of use. Bo Welch and Alec Baldwin provide a full-length, scene-specific commentary track, though for some reason or another it isn't mentioned anywhere on the backcover. Welch carries the conversation well, talking about how the various visual effects were done, while Baldwin simply pants and drools over Kelly Preston, from her head to her ankles—not that I blame him, mind you. Baldwin's character is fairly minor in the film, so I imagine he wasn't required to be on the set too much, and subsequently he asks Welch a lot of really obvious questions ("Who does the voice of The Fish?") that it gets occasionally distracting. Still, the film is short enough that this track is deserving of a casual listen. Also included are 16 Deleted Scenes (16m:20s), presented in rough cut format, often with no blue screen effects. Much of it is Myers doing the same old same old, and while a lot of it is generally funny, none of it was really essential to enhance the story at all. Still, it seems odd that a few of these weren't included just to bump the runtime closer to 90 minutes. Outtakes (06m:20s) is quick collection of the cast flubbing lines, which is funny for the first minute or so, but then becomes a little long in the tooth. Rounding things out are a trio of trailers (Dr. Seuss, Peter Pan, Shrek 2) and a segment that teaches youngsters, step-by-step, How to Dance Like The Cat. The disc is cut into 20 chapters, and features optional subtitles in English and Spanish. Hey, this was pretty funny. As shocked as I am to admit this, consider this one highly recommended.